I gathered up the supplies Sweet P and I would need (the dye was from a while back and that vinegar actually made the move from Arizona with us - there are no Safeways in the South, ha!). Next I needed a dozen or so hardboiled eggs. 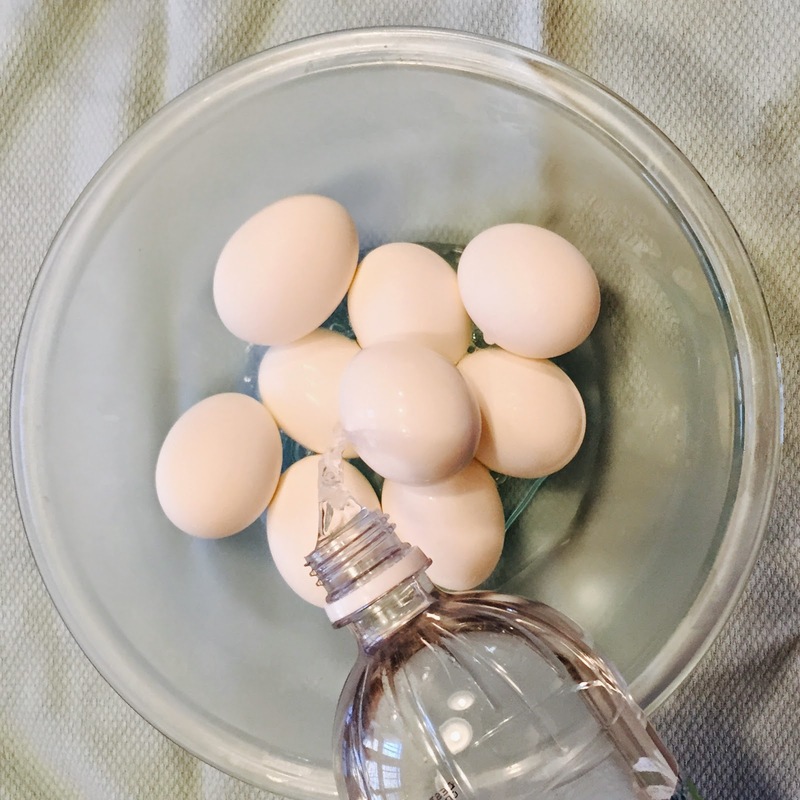 I always follow the Pioneer Woman's technique of placing eggs in water, bringing the pot to a boil, then turning off the heat and letting the eggs sit for 20 minutes. This is followed by a cold water rinse and the eggs always turn out perfectly. I had cooked the eggs the day before, so they were cold and ready for us to dye. I poured vinegar over the eggs to help the color set, and just let them air on a plate prior to the Cool Whip fun. 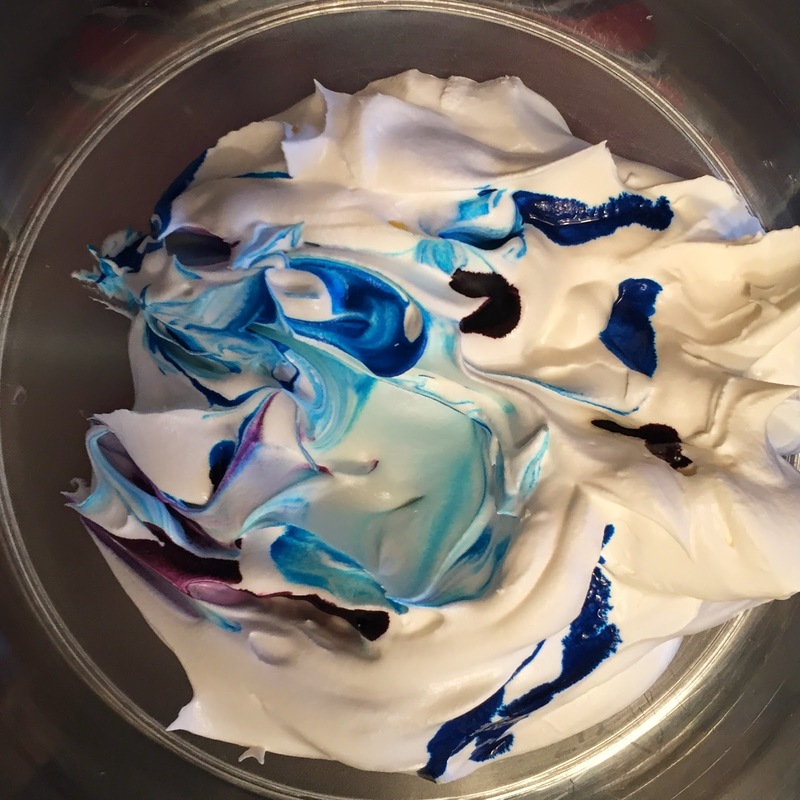 Next I plopped a bunch of Cool Whip in a big tupperware and dropped in some blue and purple food coloring. 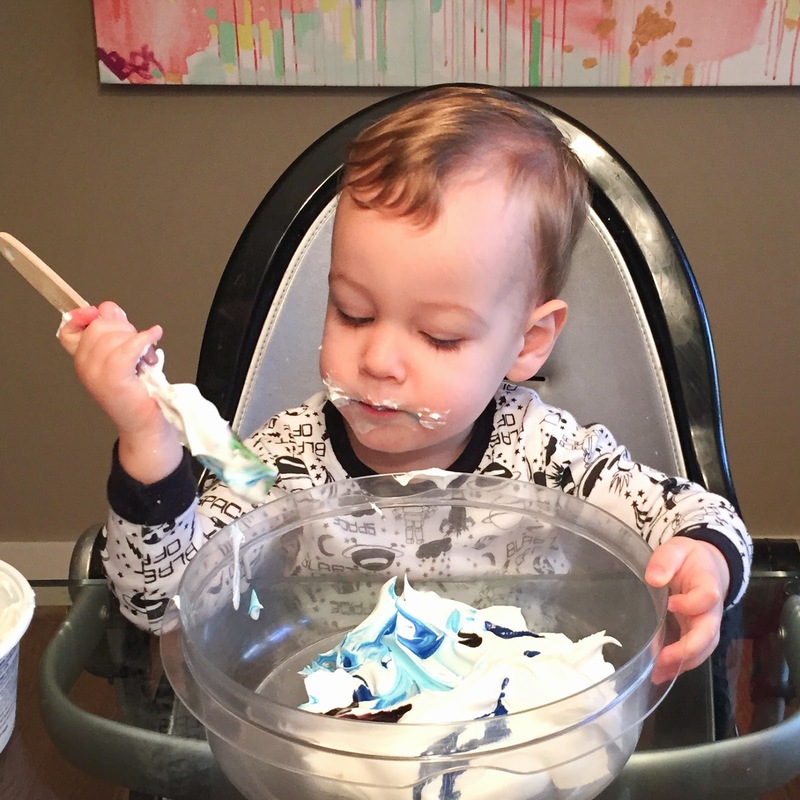 I started to swirl with a spatula and then let little man swirl some more. He pretty much immediately asked "Mouth?" which is his way of saying "I'd like to eat some of this, please." I gave him the green light and he was way excited. Take that, shaving cream! 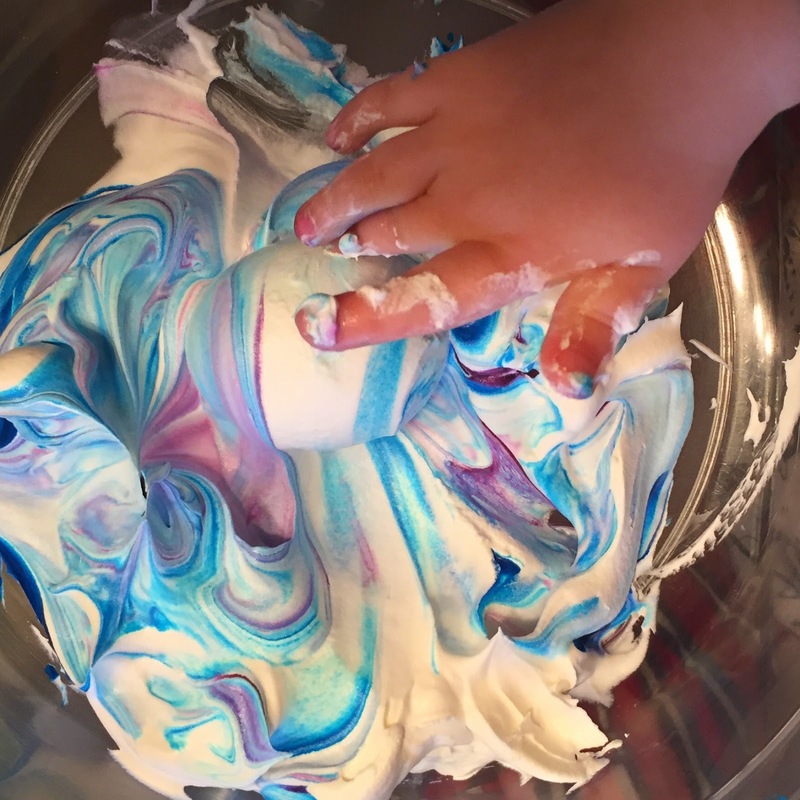 I actually didn't want the food coloring to get too mixed in because I thought a tie-dyed swirl effect would be kind of neat, so I handed Parker the first egg and he got to rolling and coating. He would stop every so often and say "mouth!" and eat a bit more. I took each egg as he was finished and placed them on a paper plate. 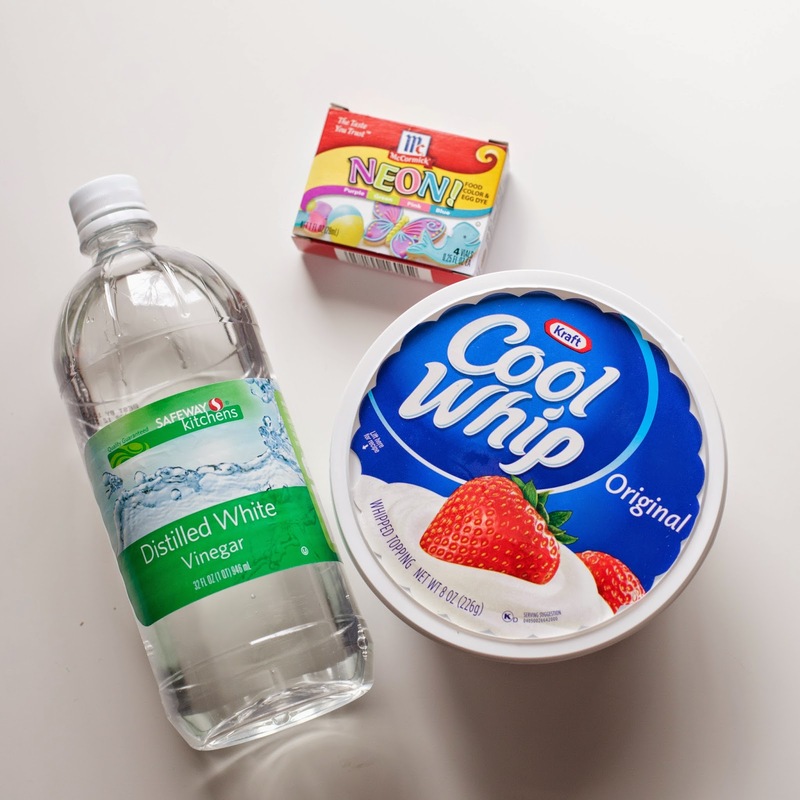 I had some wet wash cloths and paper towels handy as well because Cool Whip is always a hot mess. We made another batch of yellow and orange colored Cool Whip and followed the same technique, then we put the paper plates in the refrigerator and left them overnight. The next day I took out the paper plates and rubbed all the Cool Whip off the eggs with wet paper towels (some I actually just rinsed under water in the sink). 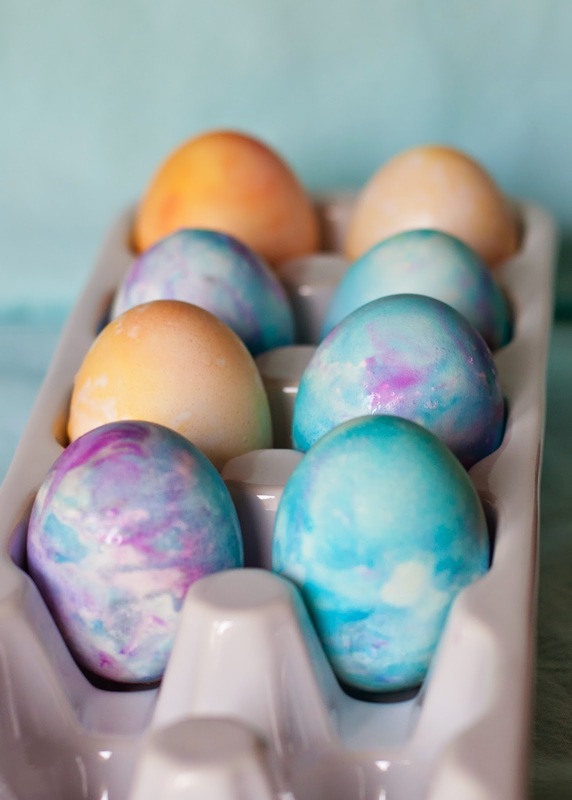 I was afraid the water and rubbing would wipe off all the dye, but the eggs still looked great! 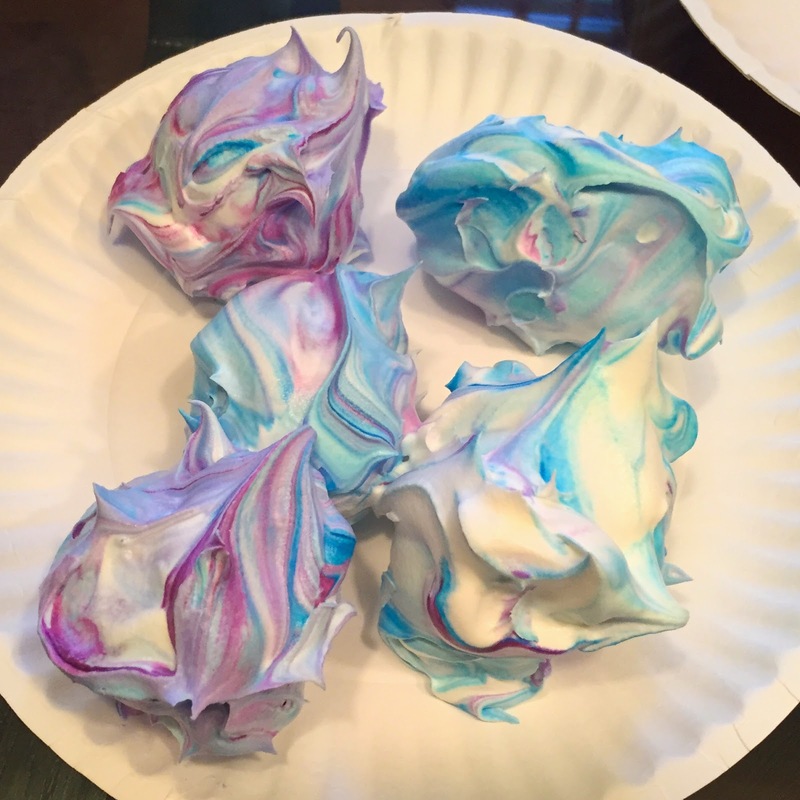 I love how only two batches of dyed Cool Whip produced all these different colors, and I really love that my just-turned-two-year-old was able to get in on the fun and dye the eggs himself! 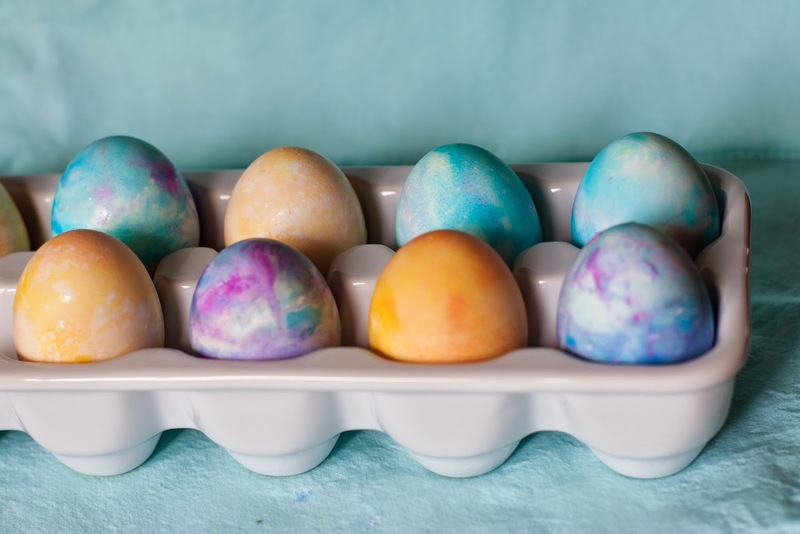 Are you dyeing Easter Eggs this year? Are you going traditional or mixing it up? Do tell! Awww, thanks! I was really surprised! Definitely an activity for the twins next Easter! Thanks so much! It was tons of fun! This is such a good idea! I am def trying this with my 2 year old! How did it turn out? Hope y'all had fun! Such a great idea! We already have the traditional dye ready to go for tomorrow. I am saving this idea for next year! Oh my gosh I love this!!!! Great idea, Mande! I'm so doing this with my girls!! I love this idea! & I love that you didn't mix the colors up too much so that you got a fun tie dye affect. Thanks so much! Can't wait to experiment more next year! These are awesome!! I've never seen this before...will definitely be trying!! Have a Happy Easter!! 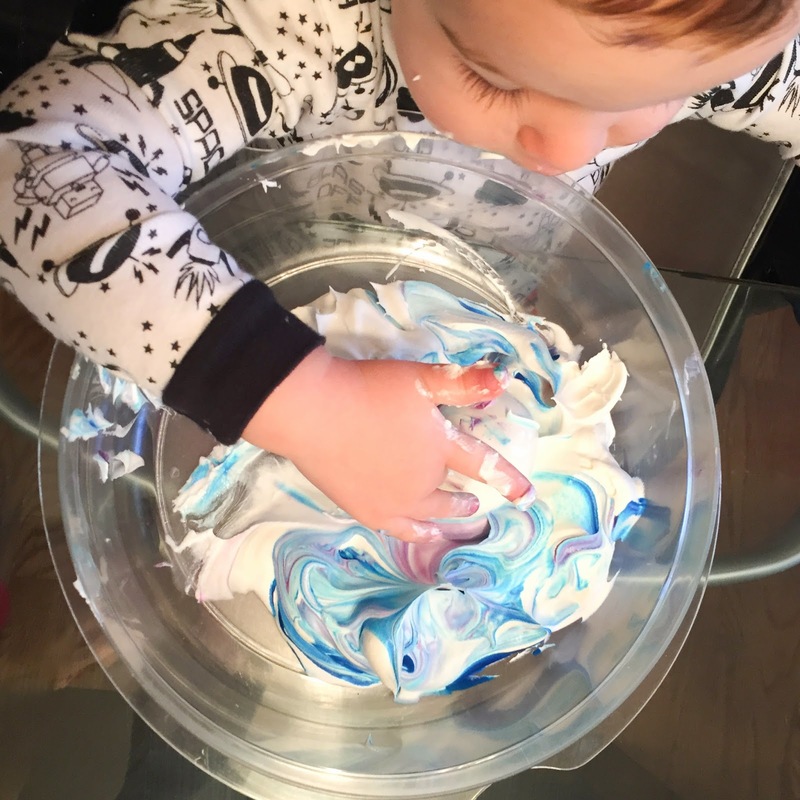 we did these with shaving cream last year...but cool whip would have been so much tastier!